Home » Sleeps5 Blog » High Line Park, Manhattan: Walking the “rails” above Chelsea in NYC. High Line Park, Manhattan: Walking the “rails” above Chelsea in NYC. 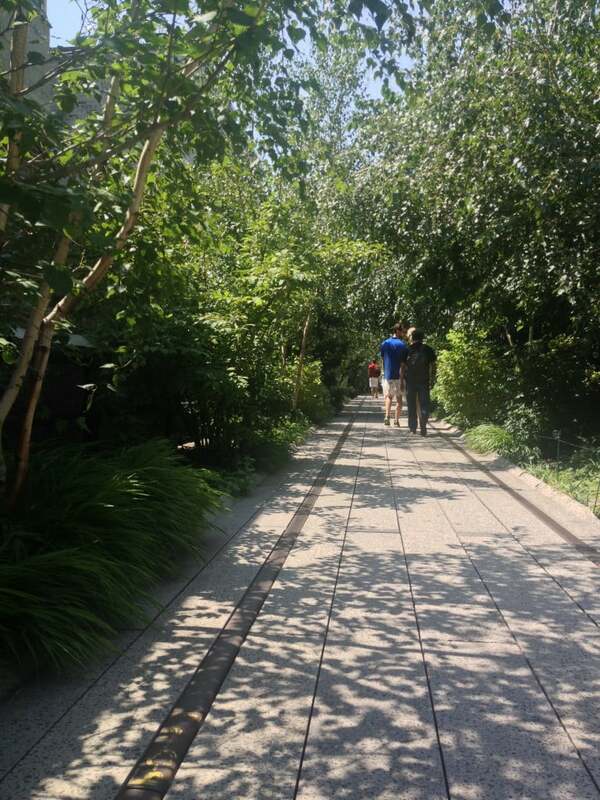 It is hard to imagine Manhattan without its popular, elevated park: the High Line, which traverses roughly 20 blocks along the western side of the island, but this park has only been open since 2009. Our family visited shortly after the first section opened, at which time it was much shorter and seemingly unknown, as we were the only people other than the park attendant on it at that time. It has since become a must-see for us every time we are in town. Here are some images and highlights along the path. 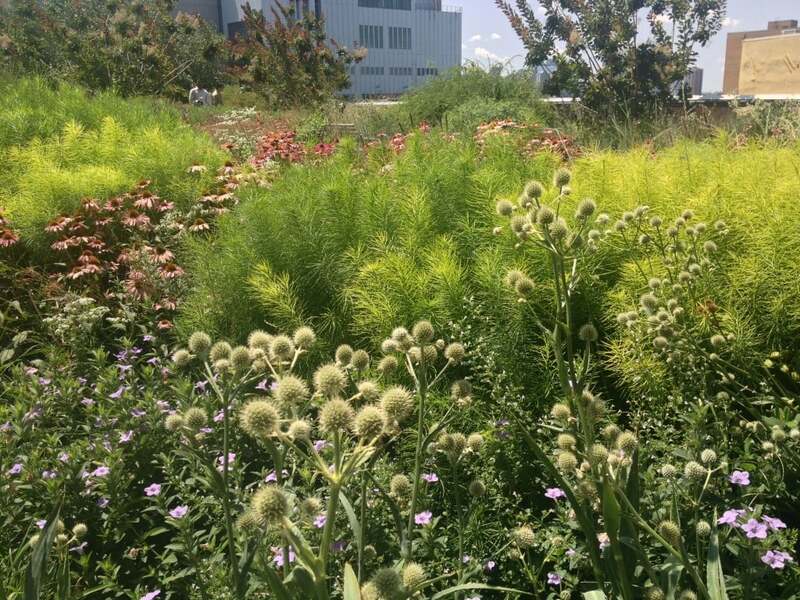 The photo above is of wildflowers planted along the High Line. 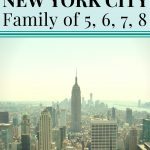 Click here for family hotels in New York City to accommodate a family of 5, 6, 7, or 8 in one room or suite. This summer I started my High Line walk on the street level with breakfast at Bubby’s (Gansevoort and Washington). It is a family-friendly restaurant with the added benefit of an old fashioned soda fountain bar. I did not have the appetite for the hefty breakfast options so just ordered some scrambled eggs and toast (for NYC reasonably priced @ $9.00). The corner of Gansevoort and Washington is the southern point of the elevated park running along the old train tracks that connected the Meatpacking District to the world beyond. These old tracks were slated to be torn down but some civic-minded folks recognized their potential. 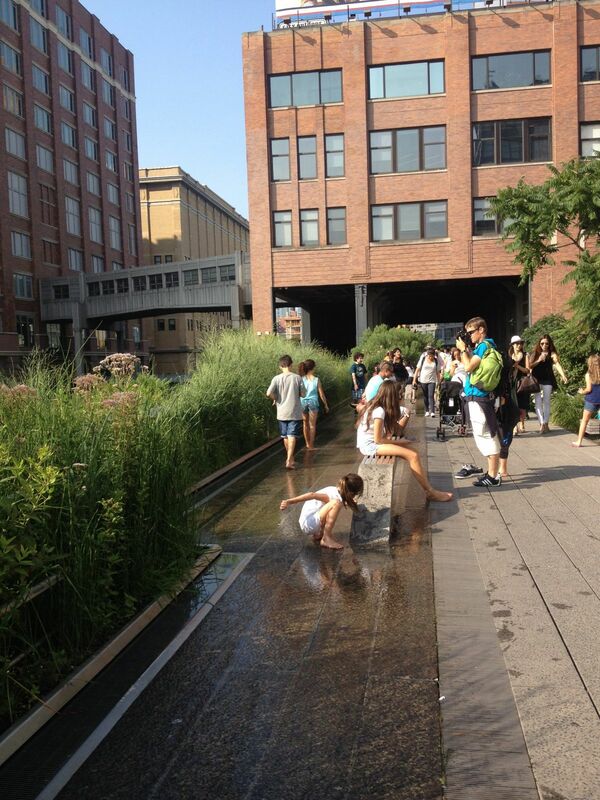 Check out the High Line park website at www.thehighline.org. Here you can begin your walk by using the public restrooms which are always clean and not heavily trafficked compared to those elsewhere along the line. The Tiffany-funded overlook is a peaceful leafy starting point. Walking north through the trees then wildflowers and grasses, stop to check out the vistas from the street ends. 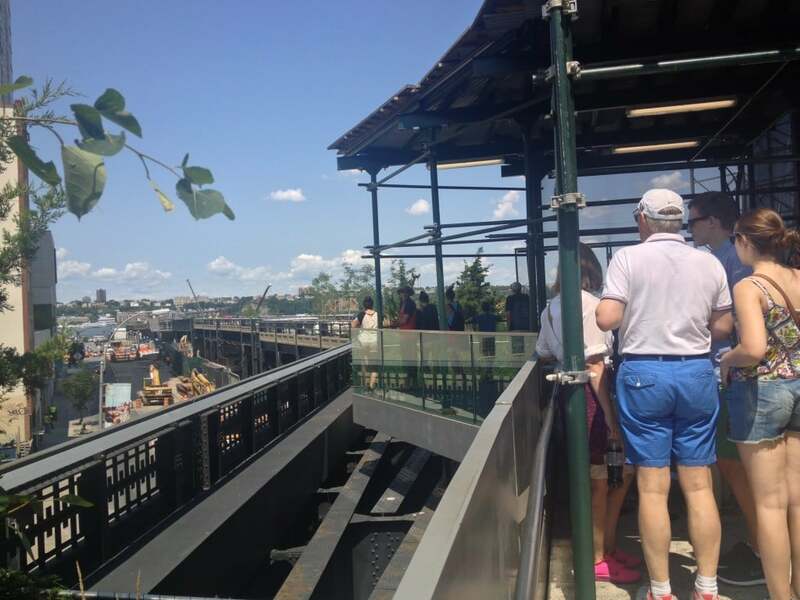 Visitors can see the Hudson on one side and views of the Chelsea neighborhood on the other. We frequently see models in the midst of a photo shoot on the southern end. Additionally, a peek through the windows of Armani often reveals a photo shoot taking place, despite the close proximity to the High Line. There are various locations every few blocks where one can walk down and enjoy the shopping or dining in the area. 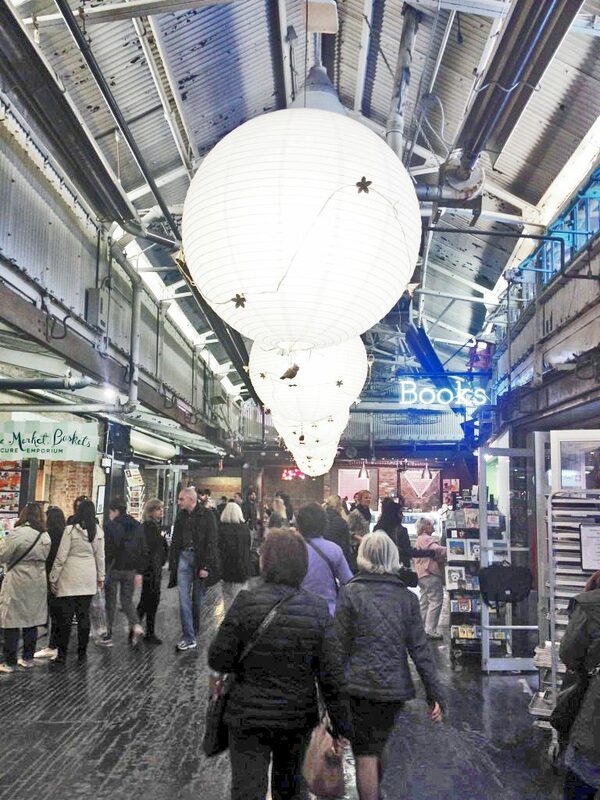 One of our favorites is visiting the very popular Chelsea Market (between 15th and 16th). This indoor market is teeming with vendors and shoppers (chelseamarket.com). The market has various specialty shops, fish mongers, boutiques and restaurants including Ronnybrook Farm Dairy, the favorite of our family of five. For the thrifty fashionistas, there are ever-changing sample sales along the way. When you can no longer take the hustle and bustle, walk back up the stairs to the High Line, keeping your eyes open for the flora and fauna buzzing between flowers and trees. Between 14th and 16th there is a theater of sorts with the streets of Manhattan as the entertainment. Enterprising musicians can also be found playing here. An observant visitor can spy a view of the Statue of Liberty by sitting (or standing) on the benches adjacent to the “theater.” Look south for a seemingly framed view of this iconic lady. There is also art along the way. 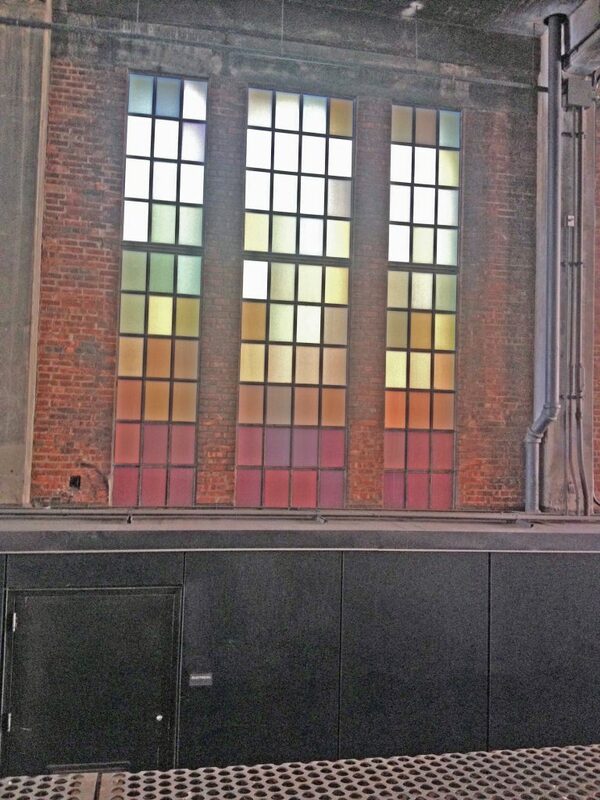 Various art installations enhance the scenery, and information about them can be found on thehighline.org site. I am afraid much of it is above my pedestrian tastes, but still I have some favorites. Another favorite spot has reclining chairs that run along the tracks near the Chelsea Market exit, with a foot fountain full of little and big folks cooling their heels. There are food carts selling yummy tacos for about $5.50, and gelato, among other things. Further up the line, near 26th, there are additional theater-like seating areas, viewing spurs and grass areas. 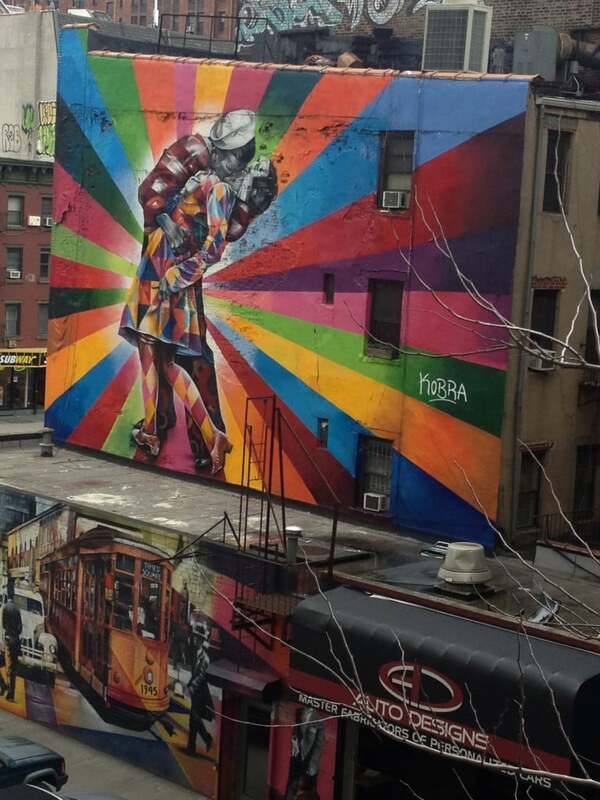 Also, keep an eye out for the colorful murals painted on the sides of buildings–they are more easily spotted during the leafless winter months. I have spied most of them on the northern end of the park. A funny sense of voyeurism pervades as the walk proceeds immediately next to residential and commercial buildings. 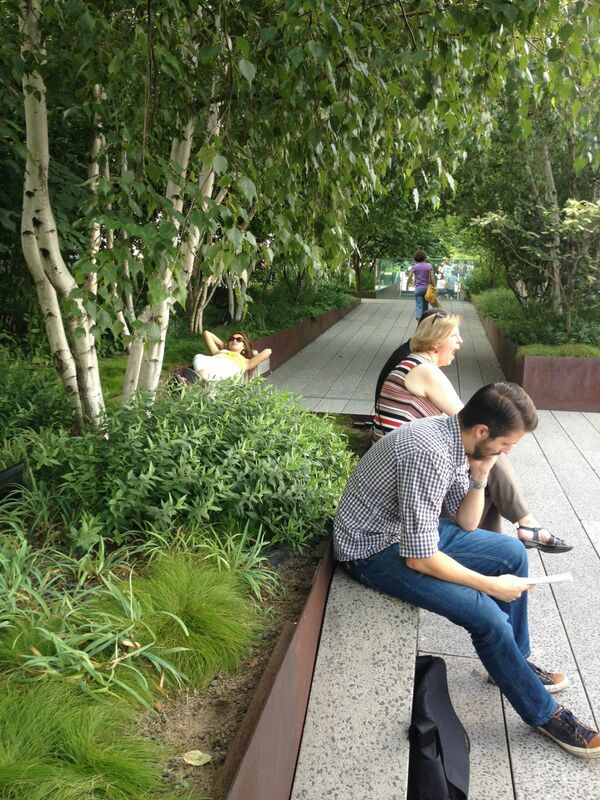 One outcome of the High Line popularity is that construction along the path is booming, and now limits the open vistas and creates some noisy spots. Keep an eye out for the Empire State Building, frequently visible and looming in the distance. A favorite section of the park has garden trees planted below so that the visitor is walking on the elevated path through the lush canopy. Looking over the edge one might spy an intriguing hammock with a blob on it. At the furthest northern point, approximately 32nd, there are views of the Hudson and the unfinished sections of the High Line. The northern point is not far from Penn Station for those looking for transportation. One can either drop down into the city: Hell’s Kitchen (scary name not reflective of current story) or walk back observing it all from another viewpoint. This is a FREE park. 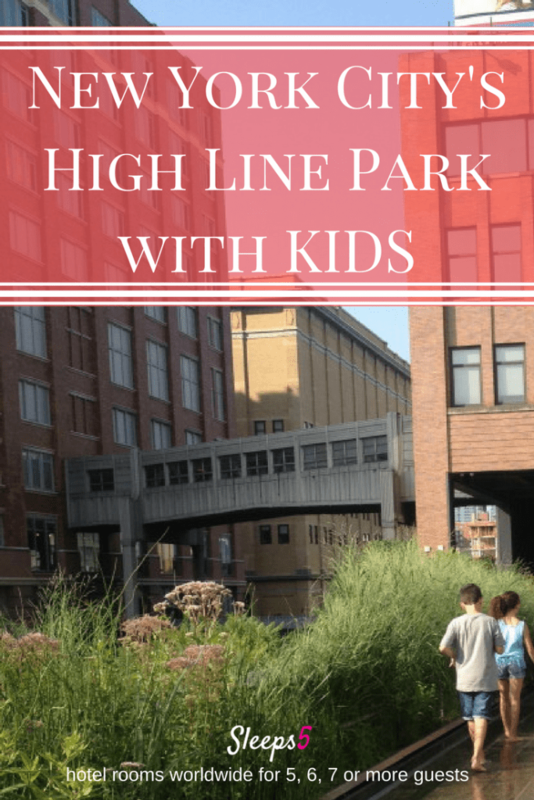 Check out www.thehighline.org for activities including Lawn Time for Little Ones, Teen Dance and other events. This website also has a map, and a listing of all the elevator access points and public restrooms. Note: During the winter some stairwells and sections are temporarily closed due to ice. Safety first! See Sleeps5’s New York City hotels page for New York family hotel rooms and suites to accommodate 5, 6, 7, or 8 people.